Blue dasher dragonfly, photographed at Green Cay Nature Center, Boynton Beach, Palm Beach County. This is a face that could stir the imagination of a science fiction writer. It does look so alien. 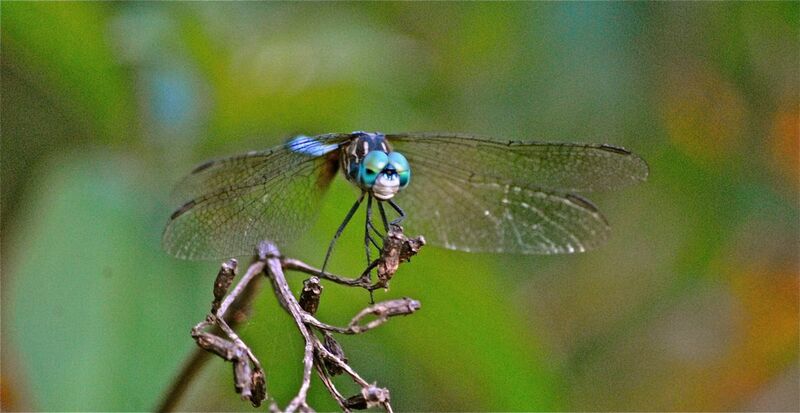 But the blue dasher dragonfly, Pachydiplax longipennis, is a creature of this planet. And an abundant one at that. The blue dasher is a member of Libellulidae, or Skimmer family, the largest family of dragonflies in the world. However, it is the sole member of the genus, Pachydiplax. Its range extends throughout North America, from British Columbia to Ontario, from California to Florida, and into the Bahamas. It can be found in wetlands, along ponds and lakes, and along slow-moving streams. The affinity for water is no accident. Like other dragonflies, the first portion of its life cycle is spent in water. Blue dashers will mate in flight or while perched. Females will hover low over water, extending their abdomens below the surface to deposit as many as 700 fertilized eggs while the male stands guard. Once hatched, the young blue dashers, called niaids, hang out in the cover and relative safety that aquatic plants afford. They are hunters, but instead of stalking their prey, they lay in wait for an unsuspecting mosquito larva, or the larva of other aquatic bug, to pass their way. After maturing, a process that includes moulting their exoskeletons several times, they will emerge from the water at night as adults. Adults perch on twigs and rocks, waiting to catch a meal, perhaps a tasty butterfly or moth. Mosquitoes, flies, flying ants and termites are also on the menu. They are aggressive hunters, and will take more than 10 percent of their body weight in prey each day. All that flying and hovering burns calories after all. Blue dashers are also territorial, will defend favorite feeding sites from others of their kind. Blue dashers are small to medium-sized as dragonflies go, maxing out at a litle under two inches long. Males and females are about the same size, each maxing out at about an inch and half in length, give or take. However, they are much different in color, with the males picking up the blue, the females a duller brownish-yellow. The eyes of the male are blue-green, while the female's eyes are light green at the base and reddish brown at the top. 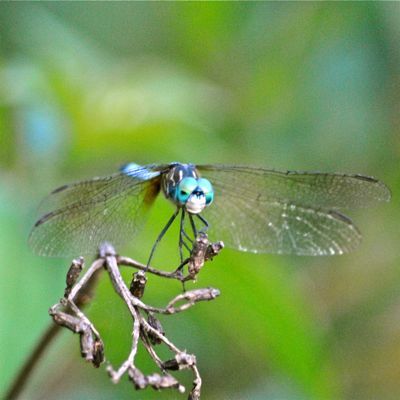 Although the blue dasher population is abundant, habitat loss looms as a threat. Loss of wetlands and degrading of water quality can affect their numbers. Fun fact: blue dasher's scientific name, longipennis, means long wings. However, blue dasher's wings aren't substantially longer than other dragonflies. 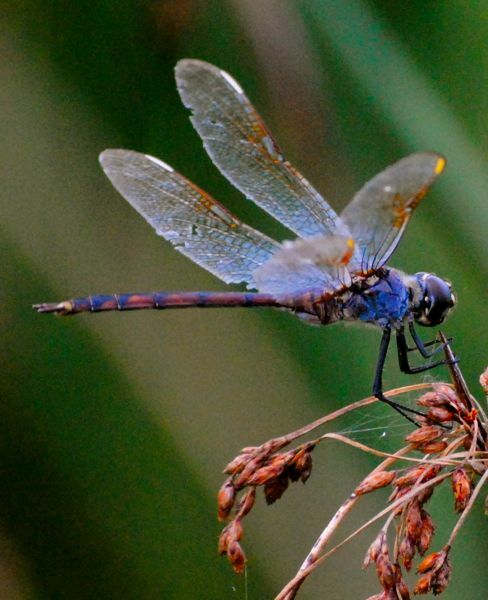 Blue dasher dragonflies are also known as blue pirates and swift long-winged skimmers. All photographs are property of the publishers and may not be used without their expression permission.